I had a sudden "aha" moment. The Pakistani air force and Army are being equipped by the US with exactly the weapons to take out the jugaad weapons of ISIS and Taliban like Toyota truck mounted watchmacallits. This is a threat to our own military vehicular traffic in case of conflict. I replied to this statement, there is nothing nuclear about it. By World War II, all the American services had versions for infantry, tanks, armored cars, ships, fighters and bombers. With a thick barrel, the standard M-2 infantry model — a.k.a., the M-2HB, for heavy barrel — weighed more than 80 pounds and could spit out 500 half-inch bullets every 60 seconds. To handle fast-moving enemy planes, engineers modified the aircraft versions to fire up to 850 rounds per minute. With cold air blowing across the guns in flight, the airborne types could have lighter barrels without overheating. It is easy to differentiate the two different versions by looking for the ground variant’s solid barrel or the aircraft variant’s perforated heat shield full of cooling holes. Coventry Airfield in the United Kingdom is several thousand miles away from the Indian Air Force (IAF) base of Mohanbari in Assam. Not for Rajeev Chandrasekhar. 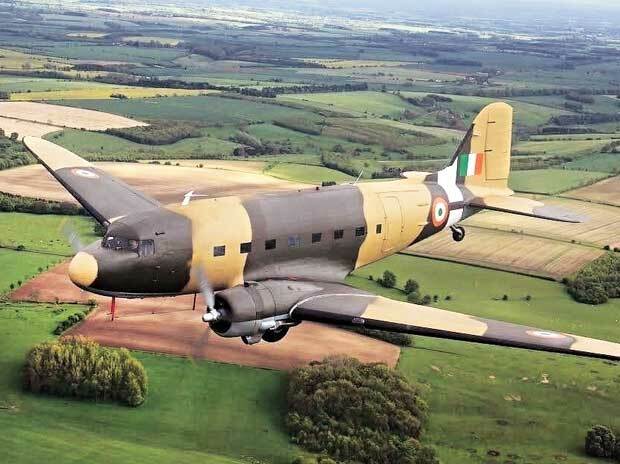 For the past few years, this Midlands air base, which was once a storied fighter station during World War II, has been host to a genially eccentric project by the Rajya Sabha MP to revive a vintage Douglas DC3 aircraft, better known as the Dakota, the workhorse that first saw action in the 1930s. Chandrasekhar bought the aircraft from Ireland in 2010 with the intention of making it airworthy and gifting it to the IAF - "free of cost, no strings attached" - for its fleet of vintage aircraft. It is a painstaking process that calls for both passion and patience. Chandrasekhar won't reveal the cost of restoring the aircraft though. Fali Homi Major, who retired as chief of the air staff, is delighted that an airworthy Dakota will finally make its way to the IAF vintage fleet. "It was the finest aircraft ever designed and the most rugged. It has operated from every airfield," he says. "You could fly it in the day, at night or in hostile mountainous areas. You could land it on short runways as well as on grass or dirt airstrips." Woodeson, however, says this aircraft will have to be flown all the way due to its vast size. These are terror weapons and I can now see why the US and European nations are developing a class of PGMs designed to hit individual vehicles on the move. Aside from that these jugaad Toyotas will need tanks, armoured vehicles or air power to take them out. 23mm AA has important anti material effect to shoot through trees, foliage, walls, doors, light vehicles etc. India needs to bring in HMGs for it's own COIN, CI forces. Counter ambush in jungles and urban areas is impossible with light or medium machine guns. The one-time "futurist" Robert Gordon has written a book with the misleading title "The Rise and Fall of American Growth". However it is not about America specifically, and doesn't focus exclusively on "growth" in the traditional sense of GDP or geopolitics. It is about the technological progress of humankind over the last couple of centuries in general... driven, we must admit, largely by Western science and technological entrepreneurship. It argues (quite convincingly) that the pace of science-driven technological progress that took off about 1870 peaked about 100 years later, and that by 1970, the high-acceleration phase was permamently over. Robert J. Gordon, a distinguished macro­economist and economic historian at Northwestern, has been arguing for a long time against the techno-optimism that saturates our culture, with its constant assertion that we’re in the midst of revolutionary change. Starting at the height of the dot-com frenzy, he has repeatedly called for perspective: Developments in information and communication technology, he has insisted, just don’t measure up to past achievements. Specifically, he has argued that the I.T. revolution is less important than any one of the five Great Inventions that powered economic growth from 1870 to 1970: electricity, urban sanitation, chemicals and pharmaceuticals, the internal combustion engine and modern communication. In “The Rise and Fall of American Growth,” Gordon doubles down on that theme, declaring that the kind of rapid economic growth we still consider our due, and expect to continue forever, was in fact a one-time-only event. First came the Great Inventions, almost all dating from the late 19th century. Then came refinement and exploitation of those inventions — a process that took time, and exerted its peak effect on economic growth between 1920 and 1970. Everything since has at best been a faint echo of that great wave, and Gordon doesn’t expect us ever to see anything similar. Aside from its being an interesting story, however, why is it important to study this transformation? Mainly, Gordon suggests — although these are my words, not his — to provide a baseline. What happened between 1870 and 1940, he argues, and I would agree, is what real transformation looks like. Any claims about current progress need to be compared with that baseline to see how they measure up. And it’s hard not to agree with him that nothing that has happened since is remotely comparable. Urban life in America on the eve of World War II was already recognizably modern; you or I could walk into a 1940s apartment, with its indoor plumbing, gas range, electric lights, refrigerator and telephone, and we’d find it basically functional. We’d be annoyed at the lack of television and Internet — but not horrified or disgusted. By contrast, urban Americans from 1940 walking into 1870-style accommodations — which they could still do in the rural South — were indeed horrified and disgusted. Life fundamentally improved between 1870 and 1940 in a way it hasn’t since. Now, in 1940 many Americans were already living in what was recognizably the modern world, but many others weren’t. What happened over the next 30 years was that the further maturing of the Great Inventions led to rapidly rising incomes and a spread of that modern lifestyle to the nation as a whole. But then everything slowed down. And Gordon argues that the slowdown is likely to be permanent: The great age of progress is behind us. But is Gordon just from the wrong generation, unable to fully appreciate the wonders of the latest technology? I suspect that things like social media make a bigger positive difference to people’s lives than he acknowledges. But he makes two really good points that throw quite a lot of cold water on the claims of techno-optimists. First, he points out that genuinely major innovations normally bring about big changes in business practices, in what workplaces look like and how they function. And there were some changes along those lines between the mid-1990s and the mid-2000s — but not much since, which is evidence for Gordon’s claim that the main impact of the I.T. revolution has already happened. Second, one of the major arguments of techno-optimists is that official measures of economic growth understate the real extent of progress, because they don’t fully account for the benefits of truly new goods. Gordon concedes this point, but notes that it was always thus — and that the understatement of progress was probably bigger during the great prewar transformation than it is today. So what does this say about the future? Gordon suggests that the future is all too likely to be marked by stagnant living standards for most Americans, because the effects of slowing technological progress will be reinforced by a set of “headwinds”: rising inequality, a plateau in education levels, an aging population and more. It’s a shocking prediction for a society whose self-image, arguably its very identity, is bound up with the expectation of constant progress. And you have to wonder about the social and political consequences of another generation of stagnation or decline in working-class incomes. Basically this guy Gordon has thrown cold water on the hubris of the tech-triumphalists for whom every new app, gadget, or startup is a "revolutionary" new innovation that will fundamentally make the world a better place. He says that on the scale of changes that alter the course of history, whatever progress really mattered took place between 1870 and 1970, and since then we're only pretending. No doubt things like Moore's law will provide for an exponential increase in processing power, data storage etc. but the whole focus of information technology is so narrowly focused and self-limiting (despite what the Apple/Google marketing people say) that it will never have a fraction of the impact on history, or serve as a profound driver of changes in the economy, in the way that radio or railroads or aviation or antibiotics did. What do people think? Do you accept his thesis? I am not sure yet if I do or not. But just for fun, in this "obsolete/jugaad weapons" thread, let me for now accept his thesis as true. If true, what it means is that the progress of mil-tech (like all tech) has essentially hit a dramatic slowdown as of the 1970s. Now I can hear the objections already. What about Gulf War 1991... the classic example of one country simply overpowering another country in conventional warfare by having a huge technological edge? That was later than 1970, wasn't it? Aha, but we can rationalize it thus. Gordon's thesis talks about American tech essentially hitting a slowdown in the 1970s. This refers to fundamental research driving new generations of technology. In fact, most of the weapons used by the US in the 1990s... from Aegis cruisers to SLCMs to Abrams tanks to JDAMs to B2s and F117s... were developed in the mid-to-late 1980s through massive defence budgets under the Reagan administration. The fundamental work that made these innovations possible happened in the 1970s onlee. Meanwhile the Iraqi army of 1991, or Yugoslav army of 1995/1999, were using mostly 1960s-era Soviet tech that was developed and weaponized in the 1970s itself. And since then, not very much has happened that is fundamental. Yes, computing power, data storage, networking have come a long way from the *average consumer* point of view. Similarly in medicine, gene therapy, monoclonal antibodies etc. that are available today were only being tinkered with in the labs in their embryonic form in the 1970s. But there is no "next generation" of this stuff... only tweaks, or jugaad improvements, upon ideas that already were known within specialist communities by 1970. So again, taking Gordon's thesis as true for the moment: can we say that the difference between, say, 4G and 5G fighter aircraft is nowhere near as significant as the difference between say 2G and 3G, or 3G and 4G aircraft? Is the JSF as much better than the F22, as the F16 was compared to the Sabre, or the Sabre compared to the P51 Mustang? The question I am asking is about incremental, and not absolute differences. I understand there are improvements, sure. But has the curve reached the point of flattening out? Are the improvements after the 1970s more likely to be incremental, as opposed to exponential before the 1970s? Does this explain why forces equipped almost entirely with "obsolete"/jugaad weapons, like the Taliban or Hezbollah, are able to deny strategic victory to forces equipped with the latest and greatest, like the Americans or Israelis? Let's go back 100 years to the beginning of what Gordon calls the era of Great Inventions. White settlers with Gatling guns and railroads completely overwhelmed spear-throwing Zulus and horse-riding Native Americans. The tech-differential then was astronomical, and hugely effective. Even during WW2, the US-Japan conflict ended when the US demonstrated a degree of technological superiority with the atom bomb that the Japanese simply could not hope to match, and was orders of magnitude more destructive than any weapon the Japanese had. Vietnam (1970s) was the first conflict in which the technological superiority of the US was not quite enough to impose a victory on the native Vietnamese. And since then, with the exception of GW1, the trend of a narrowing capability gap has held steady. Today the US and some other countries have armed drones. Of course, they're very useful, but are they a game changer? More importantly, are they a revolutionary new technology? Most of what goes into drone warfare, again, relies on fundamental work that was done by the 1970s... satellites, guidance systems, turbofan engines, etc. Yes, the processors are smaller and faster, the data storage and transmission more efficient, and the networks more speedy and reliable than ever before. But those are incremental improvements... tweaks... jugaad. Not as fundamental as say the turbojet engine over propeller engines, or the advent of spaceflight, or even radar. If this model is correct... and I agree, it may not be... then what does it mean for what India needs to do? For example: is it better to have ten squadrons of the LCA in its current form, rather than waiting until the LCA has advanced such that the specs can be certified as an extra generation ahead? Do the "generations" make that much difference anymore now that the era of great inventions and fundamental technological advances is nearly fifty years over and done with? Of course things can be tweaked and incrementally improved... and they should be. However, that can be a continuous ongoing process once the base model is operationalized, as opposed to waiting for the base model itself to hit some standard that doesn't actually represent some revolutionary advance with respect to its current state. Am I making sense at all? I'm not an engineer or a a mil-tech gearhead, and I know many many folks here have qualifications that completely outclass me in those departments. That's why I'm asking for opinions that will almost surely be more educated than mine. Read the artillery thread where I posted an article comparing US and German artillery in WWII and it shows how US arty was middling but by systems approach they dominated the battle space. And their artillery was simple and easy to maintains. I agree that LCA now is better than futuristic unobatinium structure armed with proton torpedoes. My biggest complaint is that quest for relaxed stability to make it a turning dogfighter essentially made it difficult to make and delayed. You need that for turning dog fights which depend on guns to get in third quadrant. Now we know its BVR and Radar capability is good. The gun and WVR is still iffy. The why do they need it now! Use of old tanks as armoured stationary firing posts on LoC is another such example. Shiv, Here is a history of RAF bombing in WWII.